Dylan Toby and I shot this photo close to a year ago now. It had chances of going to higher places but the chances weren't good enough, so it's retiring on the blog. We had shot the trick at night a few days prior but it didn't work out how I had hoped so it became a day mission. I was out in Langford this day and noticed the roads were drying up, and immediately called Dylan to meet up and shoot the backsmith pop out. 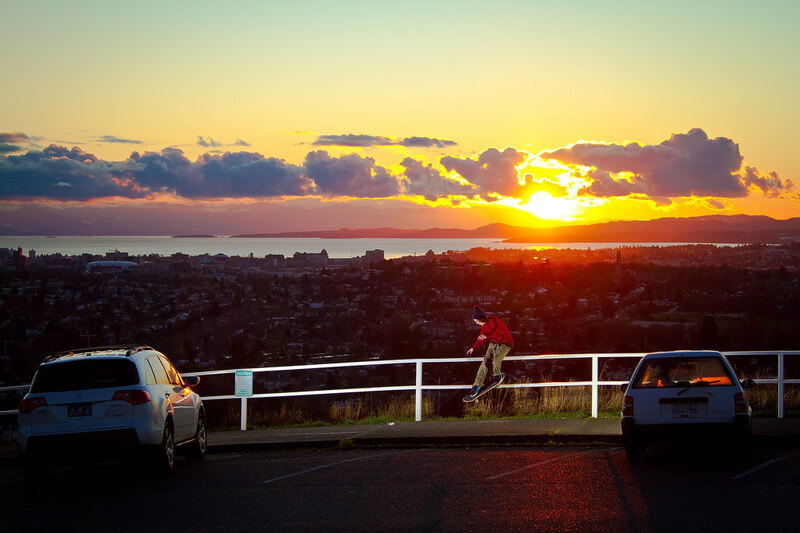 After the treacherous transit adventure to Mount Tolmie from Lang, I got there just as the sun was starting to set, and we got what we came for at the best moment in time possible. Everything doesn't line up for perfect sunset shots very often, especially when you're relying on the transit system here in Victoria. This entry was posted on Thursday, 27 December 2012. You can follow any responses to this entry through the RSS 2.0. You can leave a response.